With more people searching for the latest news via YouTube, it’s become a hackneyed saying that a picture is worth a thousand words. For a generation of digital natives, videos are ever more the most friendly and immediate source of information. The Korea Herald, the largest English daily in the country, joined the video bandwagon in 2016 with test-video productions from the scene of the Saturday protests that led to the impeachment of the former President Park Geun-hye. An official team of video production reporters were put together at the start of this year, upping the number of videos put out weekly. The Korea Herald’s videos range from major domestic and international events such as the recent historic summit between the leaders of South and the North Korea, the 2018 PyeongChang Winter Olympic and Paralympic Games and press conferences from the latest K-pop releases to new TV shows and movies here. There are also interviews with well-known Koreans and inspirational entrepreneurs, as well as introductions to distinctive local cuisine and street food. 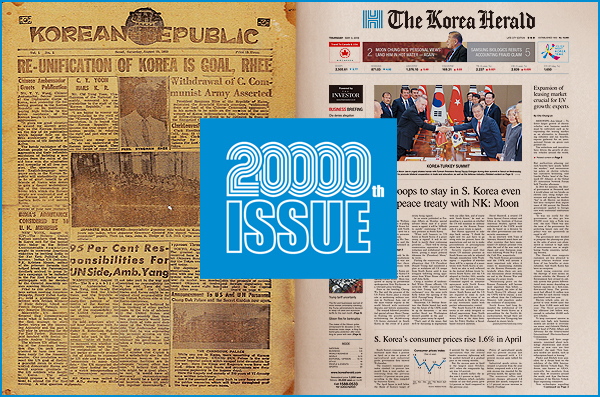 The paper has steadily amassed followers on the YouTube platform, and as of May 2018, more than 700 people now loyally subscribe to The Korea Herald’s YouTube channel, which has put out around 200 videos. The aim of The Korea Herald’s videos is to give foreign viewers a better understanding of Korean culture. These videos take a step outside well-worn topics associated with the country such as “StarCraft,” plastic surgery and mandatory military service -- which are important topics in themselves but far from representing of the whole of an ever-evolving contemporary Korea. With its reporters covering government agency beats, The Korea Herald has fast access to government-provided video materials, which it translates if needed and relays to international audiences. By far, the most widely circulating video from The Korea Herald’s YouTube channel is the full CCTV footage of a North Korean soldier’s defection across the military demarcation line. The 30-minute video was provided by the Ministry of National Defense and shared unedited via The Korea Herald channel. The video garnering the second-most views is the first video found of Korean sexual slavery victims of the Japanese military during World War II, released by the Seoul Metropolitan Government and Seoul National University Human Rights Center. The video, taken during WWII, is a valuable record of history that serves as a crucial piece of evidence to the atrocities of war. Also popular is a clip showing robots skiing on the sidelines of the 2018 PyeongChang Winter Olympics. The video shows the advancement of android artificial intelligence and the degree of advanced technology in Korea. The robot skiing clip raked in a huge viewer count after it was shared by an overseas tech media outlet. Visits to Korea by internationally popular stars like the NBA’s Stephen Curry, Tottenham Hotspur soccer players or “Avengers” movie stars regularly grab a good number of viewers. If formerly The Korea Herald had targeted those in the country who could get their hands on the physical paper, it now sees itself growing to accommodate a bigger pool of readers who access news online. By delivering close-up scenes of everyday Korean life in videos that contain the voices of its people, The Korea Herald gives its channel subscribers an idea of what to expect if and when they visit the country. Leave comments on The Korea Herald’s videos to request or suggest what videos to make in the future. For collaboration offers, send us a message at khnews@heraldcorp.com.